Why does my car lose power while driving? There are many reasons why a car can lose power while driving. We’ve compiled a list of the most common culprits. Is your car losing power while driving? If your car loses power while driving, there are a number of potential causes. In order for a car to operate efficiently, it needs to regulate the correct flow of air, fuel and compression. Any compromise to this process could result in a significant loss of horsepower. While there is a wide range of problems that could impact your power, there are a number of common offenders that could be slowing down your journeys. When you put your foot down on the accelerator and don’t get the reaction you expect, it could mean there’s a problem with the fuel system. The most likely issue is a clogged fuel filter. The purpose of the fuel filter is to ensure that dirt and debris stay out of the fuel system, so over time, it may need cleaned or replaced. When the fuel filter is clogged, the fuel pump has to work much harder, resulting in a far less efficient drive. This means you can’t get the power you need if you’re trying to accelerate when overtaking or going uphill. While the fuel filter is the most common problem with the fuel system and is the easiest to fix, a lack of power could also point to issues with the fuel line or the fuel pump. If fuel injectors are either clogged or leaking, this can cause the car to struggle when trying to reach high revs. If there are fuel injector problems, these are likely to be accompanied by other problems, including issues with ignition, misfiring and even an increased smell of fuel around the car. If your car is losing power in hot temperatures, it’s important to be aware that your air conditioning uses a portion of your engine’s power. So if you are going on a long journey on a particularly hot day, you might feel like your car just doesn’t have the pull you’d normally expect. If your engine warning light is on, this is a sign that there is a significant problem with your vehicle that requires the attention of a qualified mechanic. 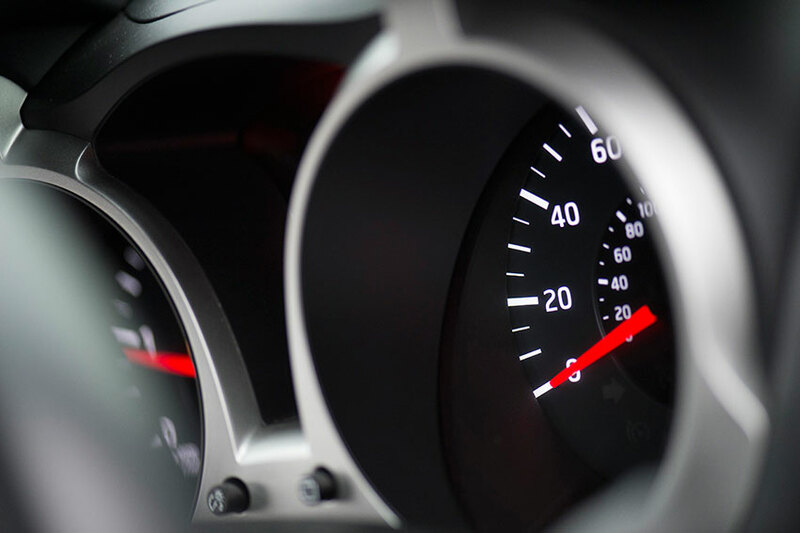 Many modern cars have engine control units that will automatically put the car into limp mode when a problem is detected, restricting power in order to ensure that driving is safe and accidents are avoided. If the light turns on with a false positive, this could also cause limp mode to be activated, even if there is no underlying issue. In any case, you should still get the vehicle inspected as this false positive could point to a problem with the electronics. Turbochargers are increasingly fitted to engines as standard. These work by increasing air pressure in the combustion chamber, allowing more fuel to be added to the mix so that more power is generated from the explosions in the cylinder. While turbos make engines more efficient, if anything goes wrong with them, the engine will lose power. Problems could be as simple as dirt or debris entering the turbo and causing issues with the mechanism. Similarly, a simple hole or loose connection in the tubing will hugely impact on performance. Turbochargers also need oil to work effectively so ensure that oil and the oil filter are well maintained. The cooling system is designed to maintain the engine at a particular temperature. In very high external temperatures, an overloaded heating system would cause the cooling fan to start working harder, taking power away from the engine and reducing performance levels. If the weather is cool and the engine is overheating, this points to a more serious problem. Always keep an eye on the engine temperature, as running with a hot engine is likely to cause serious permanent damage to a car. Power loss from an overheated cooling system could also be experienced if the car is at high altitudes, where the air is thin. If you feel your car is accelerating more slowly than usual, it could be a sign of a clogged catalytic converter. Your car’s catalytic converter cuts down on harmful emissions by using catalysts to convert harmful pollutants into water and less harmful gases before releasing them via the exhaust. A clogged catalytic converter blocks gases, meaning that the engine cannot rev to its maximum capacity. If this is the case, take the car to a mechanic where the problem can be diagnosed. For diesel cars, the diesel particulate filter (DPF) could also get blocked. The DPF is designed to remove diesel particulate matter or exhaust pollutant particles, however, like all filters, they have a finite capacity. If your DPF becomes clogged up, you may find that your vehicle switches to ‘limp-home mode’; this is mainly to prevent any further damage occurring to the engine and possible over-fuelling. When your car is in this mode, you should only drive the car for a few miles, we’d advise you take it to your nearest garage to be looked over. While timing belt or chain problems are relatively rare, if the belt/chain is not properly maintained, is incorrectly installed or does not have the correct tension, it can cause the engine valves to open and close at incorrect intervals. This will result in a loss of power, often accompanied by a rattling noise from the engine. Backfires are caused by an incorrect fuel to air ratio. These small explosions result in a loss of power when accelerating and a loud pop or bang. In some cases, this may even be accompanied by a burst of flames. There are many causes for a backfiring exhaust, including problems with the fuel pump, leaks in the fuel tank or issues with the carburettor. If you are experiencing any of these problems with your engine, your car should be inspected and assessed by a qualified mechanic in order to ensure that it’s safe to drive and prevent further damage from developing.